'Unity' on the rocks as PA security forces beat Hamas protesters, prominent official. Banks closed in Gaza, blocking PA employee wages. Yet another violent clash between Hamas members and Palestinian Authority (PA) security forces casts further doubt on the supposed "unity" behind the recent Hamas-Fatah reconciliation, which led to the swearing in of a unity government last Monday. 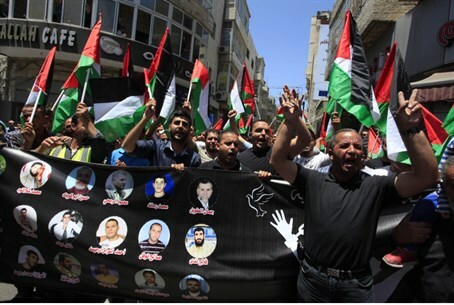 The incident began when Hamas members held a rally in Ramallah in Samaria on Monday evening, protesting in support of hunger-striking jailed terrorists. The terrorist organization has vowed violence against Israel over the issue. However, despite Hamas events in areas of Judea and Samaria controlled by the Fatah-dominated PA being legalized as part of the reconciliation deal, the Islamist group's show of strength in the PA's stronghold was not met with feelings of "unity" at all. Instead, Hamas charges that PA security forces broke up the rally and "assaulted" the Hamas members, including Hamas leader Hassan Yousef, according to the Arab Ma'an News Agency. The Judea and Samaria-based news source added that three Arab journalists also came in for "assault" by PA security forces. Hamas spokesperson Sami Abu Zuhri condemned the incident in no uncertain terms, saying it "poisons the atmosphere of the reconciliation." Zuhri pointed the finger at PA Chairman Mahmoud Abbas, demanding that he stop "treating our people with this criminal mentality." The clash brings to mind an incident last Thursday, when roughly 100 Hamas members were arrested by PA security forces in Hevron, Judea, while trying to organize a large event for "Naksa Day," the annual day of mourning over Israel's victory in the 1967 Six Day War and subsequent liberation of Jerusalem, Judea, Samaria and the Golan Heights by Israel. Cracks in the unity deal are also on display in Gaza, where a squabble over Hamas-PA employee salaries led Hamas forces to close all banks in the region last Thursday. Those banks are still closed, preventing PA employees from collecting wages. Hamas employees had their expectations of receiving backlogged salaries from the new unity government dashed last week, and in their rage, fistfights broke out between them and PA employees in Gaza, of whom there are roughly 70,000. While a unity government spokesman last week said the Hamas workers needed to be vetted by a committee before being added to the payroll, a Fatah spokesman said Hamas would receive no help paying its employees. "Hamas is attempting to burden the Palestinian Authority and the national consensus government with its political and financial crisis," said the spokesman, Ahmad Assaf. Assaf added that the reconciliation deal between the PA and Hamas did not include any agreements regarding the pay of Hamas employees. The Arab news source Wafa reported that many residents of Gaza were complaining about the closed banks, saying "we can't buy bread because we have no cash; the money is in the bank, and Hamas forbids opening the banks." According to the news site, Hamas members and security forces have destroyed ATM machines and prevented banks from being opened. They report that local business people have complained they risk great losses if the banks stay closed.